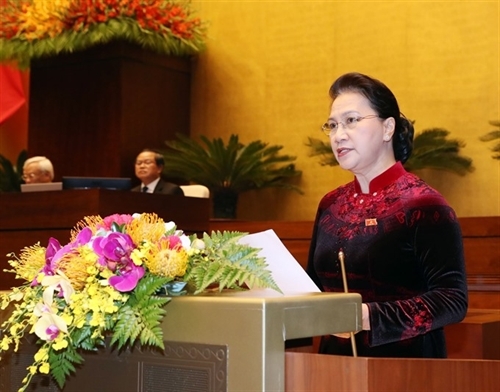 Vietnam’s parliament had worked in a “democratic, responsible and serious” manner and accomplished many important tasks, NA Chairwoman Nguyen Thi Kim Ngan said. The top legislator made the remark yesterday at the closing ceremony of the sixth sitting of the National Assembly held in Hanoi. During the session, the NA passed nine laws and discussed six draft laws. With 96.7 percent approval, Vietnam’s legislature also officially ratified the Comprehensive and Progressive Agreement for Trans-Pacific Partnership (CPTPP), or TPP-11, making the country the seventh member of the 500-million strong trade pact to do so. 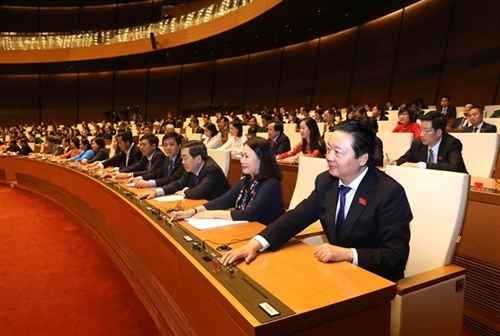 “This showcases the Party and the Government’s resolve in proactive international integration efforts, and asserts the country’s standing and its responsibilities to the international community,” NA Chairwoman Ngan said. She said the meeting had reviewed the progress of the implementation of various NA resolutions on socio-economic development and the State budget in 2018 and from 2016-20. “The National Assembly appreciates the role of the Government’s robust and hands-on leadership, and the proactive support and co-operation from the whole political apparatus, the business community and people of all classes, in the making of notable accomplishments in 2018 and in the last three years,” she said. NA deputies have also voiced their opinions on existing limitations and issues of the economy, proposed practical and detailed solutions to help the country stay on the track of sustainable development. “On these bases, the National Assembly has deliberated and approved four resolutions for the socio-economic development and State budget,” she said. The top legislator asked NA deputies to communicate the results of the meeting to voters and to continue to listen to people’s wishes and expectations, and report to the legislative body and the Government. Earlier in the day, the National Assembly adopted the revised anti-corruption law with 93.2 percent of deputies in agreement. However, provisions on how to deal with unexplained assets - an issue that drew heated discussion among NA deputies and attracted public attention - did not make it into the version of the new law, due to split opinions among lawmakers. Neither option - either bringing the case to court for review, or taxing unexplained assets - received majority support, so the NA Standing Committee decided that the issue would need further study because it was related to property rights, a basic civil right protected by the Constitution. “Additional incomes of officials and ordinary citizens have been accumulated through different periods and sources. We currently cannot effectively monitor assets and the income of people, including officials. The property tax is also still at a proposal stage. Therefore, determining whether unexplained asset have been illicitly obtained or not is difficult,” said Nguyen Manh Cuong, vice chair of the NA Judicial Committee. The exclusion of these new measures means the handling of unexplained assets will follow existing legislations. If unexplained assets are proven to have been gained from corruption through authorized agencies, they would be seized. If the case is deemed to be a tax avoidance crime, then the next steps would follow the tax law. Lessons from 10 years of implementing the anti-corruption law brought important insights to be incorporated in this revision of the law, as they provided more foolproof processes for asset valuation as well as more stringent penalties for officials and elected representatives who misdeclared their assets. There is also a whole new chapter in the revised law dedicated to anti-corruption in the non-public sector, effectively extending the fight against corruption into the private sector. It provides regulations to avoid conflict of interests, particularly regarding private businesses that provide services and goods to the public sector. Comprising 96 articles arranged into 10 chapters, the revised anti-corruption law will take effect starting July next year.